Welcome to the AFF Interfaith Network, and take action this January! Welcome to the Alliance for Fair Food Interfaith Network! Since the very beginning of the CIW's movement for human rights in the agricultural industry, people of faith from a number of traditions and denominations have represented a central constituency in the vibrant multi-cultural and multi-generational Alliance for Fair Food. The AFF Interfaith Network is a community composed of clergy, lay leaders, congregations, and people of faith from around the country who are committed to creating and sustaining the "new day" of respect, dignity, and justice for farmworkers brought about by the Coalition of Immokalee Workers and their award-winning Fair Food Program. People of faith bring to bear upon the movement for Fair Food spiritual uplift, grounding in religious tradition, and the moral weight of voices of faith in society, while houses of worship remain centers of mobilizing, moving community members from the pews to public demonstrations while housing and feeding innumerable farmworkers and allies during their tours and demonstrations. Most recently, major denominations and faith-based organizations have passed national and state-wide resolutions endorsing the Wendy's Boycott to bring the final fast-food holdout into the Fair Food Program. Read more about the role of people of faith in the Campaign for Fair Food here. Through the AFF Interfaith Network, take action next January! On January 18, 2018, hundreds of faith leaders from around the United States will join together to fast for a day in protest of Wendy’s executives’ ongoing refusal to join the Fair Food Program and in solidarity with the workers who continue to labor in dangerous and unfair conditions as a result. Sign up to participate today! As Wendy’s ignores the abuses perpetrated in the name of cheap produce, it is the responsibility of those who care for the integrity of the community in faith and practice to elevate the moral demand for dialogue. On January 18, public figures from across this nation’s religious landscape will fast and peacefully demonstrate their resistance at local Wendy’s restaurants to educate, mobilize, and inspire their communities to respond to the invitation of the spirit of justice. While it carries forth the current call to action in the Wendy's Boycott, this upcoming national mobilization led by faith leaders is a conscious commemoration of the history of the farmworkers’ struggle. In December 1997 and January 1998, six farmworkers in Immokalee, FL, made the decision to stop eating until the growers who owned the farms on which they toiled would hear their concerns. Low wages, verbal and physical violence, sexual abuse, and even forced labor plagued Florida tomato fields, and the workers who picked in those fields demanded better conditions. The hunger strike lasted 30 days, and only ended when former President Jimmy Carter and Bishop John Nevins of the Catholic Diocese of Venice intervened to call for a dialogue with growers on the condition that the workers would break their fast. 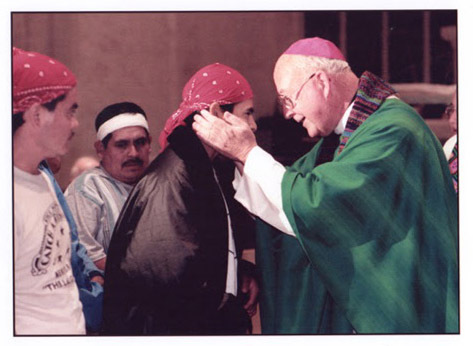 On January 18, 1998, at a Catholic mass with over 800 people in attendance, they did. Today, the fight for justice in the agricultural industry continues. Incredible progress has been made through the CIW's Presidential Medal-winning Fair Food Program, but outside of the protections of the Program, wages are still stagnant and workers are still vulnerable. Gender-based violence is still epidemic, a problem highlighted by the CIW’s “Harvest Without Violence” initiative. The Fair Food Program is a proven, market-enforced answer to these violations of personhood, but without the courage of its corporate partners to do what is right for their workers and their industry, its implementation and expansion of critical human rights protections is hindered. On the twentieth anniversary of the hunger strike, January 18, 2018, the Coalition of Immokalee Workers is calling on its national network of allied faith leaders to observe a day of fasting and public testimony in remembrance of the history of the workers' struggle and in a demonstration of commitment to the Wendy's Boycott. Participants are encouraged to stand outside of their local Wendy’s franchise for three hours as they fast, where they will serve as witnesses to the reality of oppression and voices of hope for visiting allies and passersby. Fair Food supporters nationwide will be called upon to support the faith leader-led public witnesses at Wendy's restaurants around the country. Clergy of all faiths have the singular privilege in their societal location to raise the moral issue of the oppression of farmworkers, to give of their time and resources to the building of a new economy. Let us, in the spirit of unity and justice, respond to that call. If you're ready to commit to fasting and organizing a public witness at your local Wendy's on January 18, 2018, fill out this form or get in touch with us at organize@allianceforfairfood.org! If you know a faith leader who should be involved in this effort and want to support them in their public witness, pass the invitation along. We'll follow up in the coming weeks with spiritual and direct action resources, as well as a map and running list of who's signed up so far. CIW Women's Group Harvest without Violence Tour arrives in Columbus!